I purchased both of my receivers, I do not rent them. Even so, DirecTV charges me junk fees for HD, which should be included with the base package, and the DVR service capability, even though it is my personal equipment. I equate this to the US airlines who charge top dollar for airfare, and then make you pay an additional $25 to load your bag. These fees are a disgrace. In London, we did not want to pay for cable or satellite television, so I purchased a small USB terrestrial HD antenna for Mrs. Sopwiths’ laptop. It was awesome. She received 88 HD television and radio stations right on her laptop. I decided to purchase a HD terrestrial antenna for my Los Angeles home to see if I could receive LA TV stations over the air. 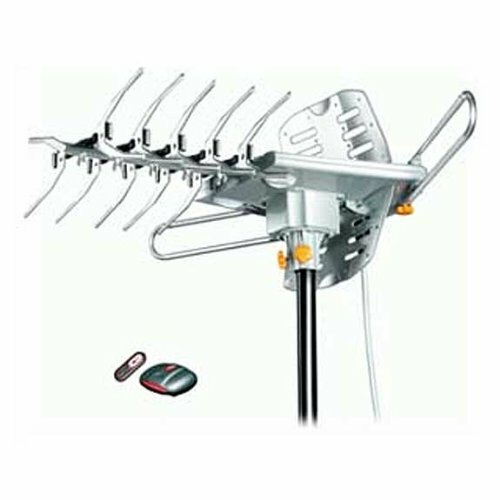 I found the Lava Electronics HD-2605 UHF/VHF HDTV Antenna with Remote Control on Amazon and found out the manufacturer will accept returns for 90 days – no questions asked. This was great, because I could send it right back if it did not receive any HD channels. When the antenna arrived, I decided to test it without going to too much trouble. I carefully opened the package and took pictures of the packaging so I could be sure to get it back in the box if I had to send it back. I clamped the antenna to the top of a 6′ stepladder, plugged it in to my TV with the 30′ coax cable, pointed the tail of the antenna towards downtown LA, and scanned for channels. To my utter amazement, the antenna pulled in 9 channels. I was able to receive channels 2, 4, 7, 9 and 11. This is all the big players – CBS, ABC, NBC, and Fox. Even better, the clarity of the HD signal over the air is incredible. In order to save bandwidth, satellite and cable providers compress the HD signals they deliver to you. The terrestrial signal is not compressed. You have to see the clarity to believe it. Once I knew I was going to keep the antenna, I made plans to get it mounted on my roof. Last Saturday, armed will all the right tools, I mounted the antenna 30′ feet in the air with a clear shot to downtown LA. Once it was wired up, I again scanned for channels. To my sheer joy, I was able to receive 95 channels! I had no idea there were so many LA TV channels. All but one are broadcast in HD. Mounting the antenna high makes a big difference. Even if you think you are too far away from HD signals, I suggest you buy a terrestrial antenna and see if it will work for you. To complete the taking back of our TV, I purchased a FireTV box from Amazon, and signed up for SlingTV for $20 per month. I am already a Netflix subscriber ($9.95/Month) and I get Amazon movies with my Amazon Prime subscription. I canceled my DirecTV subscription, and get better television for $29 per month. Ol’ Sopwith will continue the fight against greed driven companies who gouge their customer base with junk fees.